Personal Edition lets you manage Contacts for up to 3 different Androids/iPhones for the price of one. Only download and install on your own personal Windows computer. Family Edition lets you download and install on all windows computers of your family and manage contacts for up to 8 different Androids/iPhones in your family for the price of one. A specially priced, benefit-rich bundle created for business professionals. It is a one-year license that lets you download and install on all your company's windows computers and manage contacts for unlimited Androids/iPhones for the price of one. 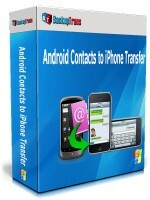 It is a one-time usage license which lets you transfer contacts from one Android to one iPhone. You have 48 hours to use this one-time usage license software.